Kouvola is a town and municipality in southeastern Finland. On the 15th (Mon), delve into the lush surroundings at Niivermaki Nature Conservation Area, then pause for some serene contemplation at Pyhan Ristin kirkko, then pause for some serene contemplation at Main Church, and finally look for all kinds of wild species at Arboretum Mustila. To find traveler tips, other places to visit, and more tourist information, you can read our Kouvola trip itinerary maker site . Helsinki to Kouvola is an approximately 1.5-hour train ride. You can also drive; or take a bus. In April, plan for daily highs up to 8°C, and evening lows to 0°C. Cap off your sightseeing on the 15th (Mon) early enough to catch the train to Lappeenranta. Start off your visit on the 16th (Tue): contemplate the long history of Lappeen Marian kirkko, admire the masterpieces at Lappeenrannan taidemuseo, pause for some serene contemplation at Church of the Intercession of the Mother of God, then pause for some serene contemplation at Nuijamaa Church, then pause for some serene contemplation at Joutsenon kirkko, and finally pause for some serene contemplation at Lauritsala Church. To find ratings, reviews, other places to visit, and more tourist information, refer to the Lappeenranta road trip tool . Traveling by train from Kouvola to Lappeenranta takes an hour. Alternatively, you can drive; or take a bus. In April, daily temperatures in Lappeenranta can reach 8°C, while at night they dip to -1°C. 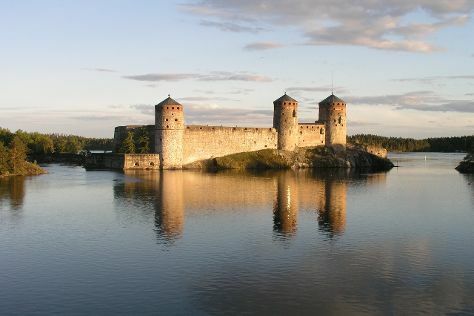 Finish up your sightseeing early on the 16th (Tue) so you can go by car to Savonlinna. Start off your visit on the 17th (Wed): appreciate the history behind Olavinlinnan Musta Passi, examine the collection at Savonlinna Provincial Museum, explore the historical opulence of Olavinlinna Castle, then pause for some serene contemplation at Pikkukirkko, then look for gifts at Taito Shop Savonlinna, and finally pause for some serene contemplation at Savonlinna Cathedral. For ratings, traveler tips, more things to do, and tourist information, read our Savonlinna tour itinerary builder . Getting from Lappeenranta to Savonlinna by car takes about 2.5 hours. Other options: take a train; or take a bus. April in Savonlinna sees daily highs of 7°C and lows of -2°C at night. Finish up your sightseeing early on the 17th (Wed) so you can go by car to Kuopio. Kuopio is a city and a municipality located in the region of Northern Savonia, Finland. On the 18th (Thu), test your team's savvy at popular escape rooms, take in the architecture and atmosphere at Lutheran Cathedral, then take in nature's colorful creations at Snellman Park, then pause for some serene contemplation at St. Nikolaos Cathedral, and finally explore the activities along Valkeisenlampi. Plan my trip to Kuopio with suggested itineraries provided by Inspirock. Getting from Savonlinna to Kuopio by car takes about 2.5 hours. Other options: do a combination of bus and train; or take a bus. In April, daytime highs in Kuopio are 7°C, while nighttime lows are -1°C. Finish your sightseeing early on the 18th (Thu) to allow enough time to take a train to Tampere. You'll explore the less-touristy side of things at Rauhaniemi Beach and Birthplace of Jean Sibelius. Step out of the city life by going to Seitsemisen Kansallispuisto and Torronsuo National Park. When in Tampere, make a side trip to see Evo Hiking Area in Haemeenlinna, approximately 1h 25 min away. Next up on the itinerary: soothe aching muscles at some of the top local wellness centers. To find where to stay, more things to do, and other tourist information, use the Tampere trip itinerary planning app . Getting from Kuopio to Tampere by train takes about 3.5 hours. Other options: drive; or do a combination of flight and train. In April, daytime highs in Tampere are 8°C, while nighttime lows are -1°C. Finish your sightseeing early on the 21st (Sun) to allow enough time to take a train back home.